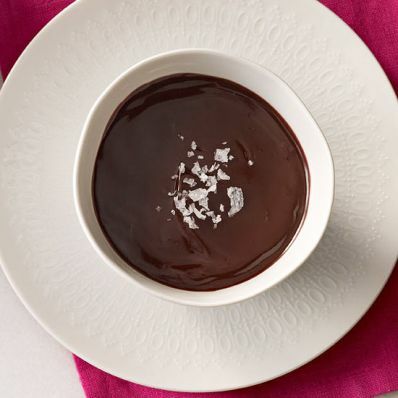 2 of 4 Immediately pour hot mixture over chocolate in a bowl. Cover with plastic wrap and let stand 3 minutes. Uncover, add vanilla and stir to completely combine. 3 of 4 Pour into 8 4-ounce ramekins and let cool. When room temperature, cover each with plastic wrap, and refrigerate for at least 6 hours or overnight. 4 of 4 Before serving, sprinkle with a pinch of sea salt flakes.